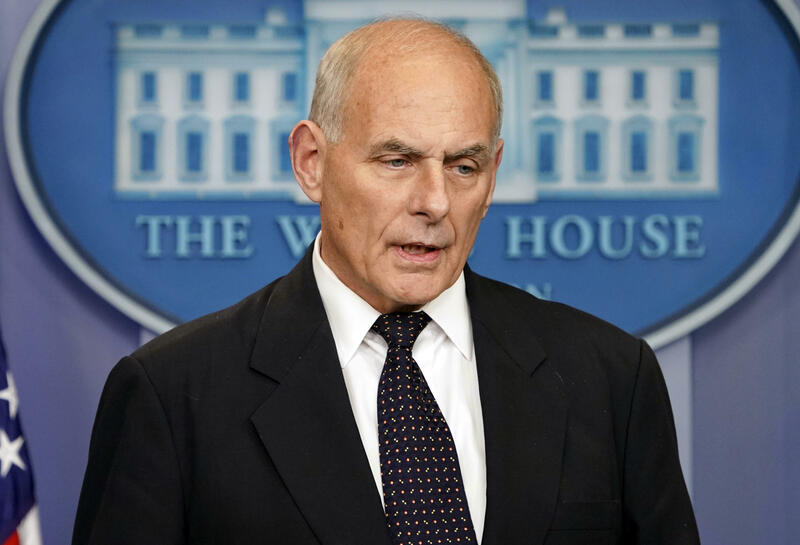 White House Chief of Staff Gen. John Kelly made a surprise appearance in the White House briefing room Thursday afternoon to address the controversy stirred by President Trump about the contacts of presidents with the families of deceased soldiers. He told reporters he was "stunned" to find out that a member of Congress, Rep. Frederica Wilson, D-Florida, had listened to the phone call Mr. Trump made to the widow of Army Sgt. La David Johnson, Myeshia Johnson, as she made her way to the airport to greet the remains of her late husband, timing that was reported by CBS Miami. "I was stunned when I came to work yesterday morning, and brokenhearted at what I saw a member of Congress doing," Kelly said, "a member of Congress who listened in on a phone call from the President of the United States to a young wife, and in his way, tried to express that opinion: that he's a brave man, a fallen hero." Joyce Jones, a spokesperson for Wilson, responded to Kelly's comments in a statement to CBS News. "The Congresswoman has decided to not make any further comment on this issue. The focus needs to be on helping a grieving widow and family heal, and should not be on her or Donald Trump. She has nothing else to add but stands by the statement issued last night," the statement reads. Kelly went on to explain that the president had expressed his condolences the way he did under Kelly's advice, which was based on what Chairman of the Joint Chiefs of Staff Gen. Joseph Dunford had told him when he appeared at his door early in the morning in 2010 to inform him that his son, Robert Kelly, had been killed in Afghanistan. "'Kel,'" he recalled Dunford said of his son, "'he was doing exactly what he wanted to do when he was killed. He knew what he was getting into by joining that one percent. He knew what the possibilities were because we were at war. And when he died...he was surrounded by the best men on this earth, his friends.'" "That's what the president tried to say to four families the other day," Kelly told reporters. "'He knew what he was getting himself into' because he enlisted," Kelly said, apparently quoting a much-discussed part of Mr. Trump's phone call to the widow. Kelly said that there is an ongoing investigation looking into what happened in Niger when U.S. soldiers were killed in an ambush attack by extremists, but continued his criticism of both Wilson and the overall coverage of the story. "It stuns me that a member of Congress listened in on that conversation. Absolutely stuns me. And I thought, at least that was sacred," he said. "Life, the dignity of life was sacred, that's gone. Religion, that seems to be gone as well. Gold Star families, I think that left in the convention over the summer. I just thought, the selfless devotion that brings a man or woman to die on the battlefield, I just thought that that might be sacred," Kelly said. Mr. Trump has been criticized for his response to the attack in terms of his attempts to contact the the fallen soldiers' families. "There's no perfect way to make that phone call," Kelly said in defense of the president. He explained that the president had also asked him how previous administrations handled the process of contacting soldiers' families following their death. "I believe they all write," he recalled explaining to Mr. Trump, adding that past presidents, including both former presidents George W. Bush and Barack Obama did not always call. And he acknowledged that he did not receive a call from Obama, who was president when his son was killed. "President Obama did not call my family. That was not a criticism. That's not a negative thing," Kelly told reporters. "I don't believe President Bush called in all cases." Kelly said he has "no knowledge of any Russian connection" with regard to the Niger attacks. "Understand, there's tens of thousands of American kids doing the nation's bidding all around the world," Kelly said. "They don't do it for any other reason for their sense of selfless devotion to this nation," he later added. Kelly said that there is an ongoing investigation into what happened in Niger when U.S. soldiers were killed in an ambush. He explained that the soldiers were there "working with partners, teaching them how to be better soldiers, teaching them how to respect human rights, teaching them how to fight ISIS." "Let's try to somehow keep that sacred," Kelly said of respecting soldiers' deaths. He then took his first question from a Gold Star family member reporter. "I was stunned when I came to work yesterday, and broken hearted," Kelly said of Rep. Frederica Wilson, D-Florida, who claimed to be present for a call Mr. Trump made to a Gold Star family member. "It stuns me that a member of Congress would have listened in on that conversation," he said. "The phone call is made to the next of kin only if the next of kin agrees to take the phone call, sometimes they don't," Kelly said, explaining that a next of kin may be a spouse, parent or sibling. He added that typically, the next of kin is open to taking the call. White House Press Secretary Sarah Huckabee Sanders invited White House Chief of Staff John Kelly to the podium. He started off his remarks by explaining the process behind a U.S. soldier's death. Kelly then went into the presidential communication process for contacting the families of the deceased. "There's no perfect way to make that phone call," Kelly said. Kelly said that President Trump asked him about the process under former administrations. "I believe they all write," he recalls explaining to Mr. Trump.